Haha, Shriya doesnt say 100 words yet, but she LOVES her ‘First 100 words’ book. Once flipping thru its pages, she saw a baby pic and immediately she said ‘chee, chee’ And then only I noticed that, the baby was wearing Diapers and its right hand is on the Diaper. When I change her, when she touches the diaper, I say ‘chee’ to her meaning, its Yuckie and she shouldn’t touch it, and she says the same to that baby. Hahaha! She identifies Ball, says dhoodhoo for Milk in the Bottle, says Bye-Bye for Car. My clever muttoooooo 🙂 Love ya! Thanks to Barney, she loves that ‘Barney’s Music time’ and once there’s Old McDonald in it. And now, whenever I sing ‘Old McDonald had a farm’ to her, she says ‘ee-aa-ee-aa-oo’ and once I say cow, she prompts ‘moo-moo’ 🙂 How sweet!!! And it’s very cute when she tries to feed her doll, offer it some water, cover her with a blankie, and pats it and puts her to bed!!! She pretends to be mommy to the doll and does what all I do to her…How cute is that!!! One of the main task accomplished during our Vacation – ‘Shriya now likes [not loves] to play in water’ YAYYYY!!! Earlier, I tried to get her in to the pool, this summer and it didn’t work. She ended up in a huge cry that embrassed me when fellow pool mates looked at me like some cruel-mom kind. And we decided to get her over with her fear of water. Shriya started to help us a lot these days…She loves to act big-girl thingie nowadays and doesn’t allow us to feed her or help her. And it looks really cute when she does that! – If she sees dust pan and brush, she starts cleaning the floor. – When food gets spilled on the floor, she cleans it off using Bounty. 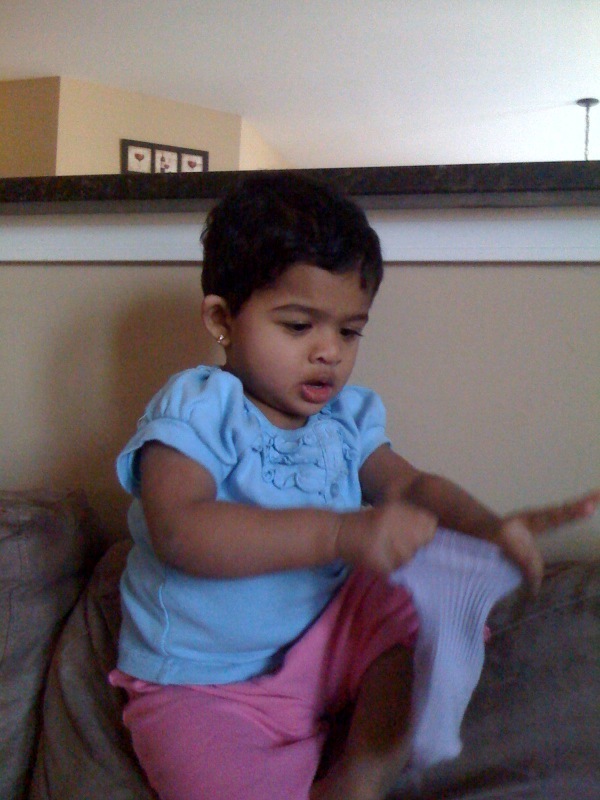 Shriya had a Hair cut last weekend. Her curls getting waaay too thick esp at the back of her head. And being Cold-Winter season now, during the days I wash her hair, its getting difficult for me to dry her hair. [Did I ever mention about her mad-run for Hair Dryer’s noise???] So Hair cut was the only solution for me. We went to snipits to have a nice trim to her hair. And OMG!!! she screamed, cried , tears all over her face…Suckers didnt work. TV didnt work. Consoling words didnt work. It was an unpleasant experience, but we managed it somehow. And they presented her with 1st hair cut certification 🙂 and a lock of her curl!!! I love it!! !